Just a fun way for a bunch of us to nose around other peoples spaces and get creative ideas. It is the start of a canvas for a friend. 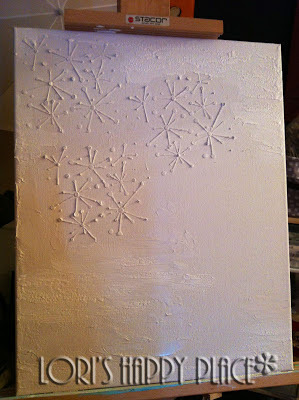 Basically just modeling paste thru a stencil, gesso, and crackle paint right now. I have no real plans of what I am doing next, so keep watching as it evolves. The stencil I used is Boy Genius from artistcellar.com. The reason I missed last week, is because approximately 6 hours before Julia posted her starter email, I was putting my beautiful kitty to sleep. His name was Spencer, and I was honored to be his Mommy for 21 years, 9 months, and 29 days. (No that is not a typo. I was His mom for over half my life.) It was horrible and heartbreaking, even if it was something we knew was going to be happening soon. In the end, he decided the time. So sad!! For those who are interested in my final coaster pictures. Those will be featured on Artistcellar.com on February 9, 2013. Thanks for joining me at my desk this Wednesday. Remember - "Create every day, and enjoy!"" Hi Lori, I am so sorry that you have lost your beloved furry friend. We keep them alive by keeping them in our hearts. Hi Lori, so very sorry to hear about the loss of your beloved Spencer and hope that happy memories ease your pain. so sorry to hear about your poor baby, time heals but we never forget. Love your finished flower canvas it really is stunning. I am looking forward to seeing this new canvas grow. Oh you have made me cry how horrible and tragic, I am sure he was so happy to have you for a mom for all those years, loving him. A piece of you will always be with him. Love the canvas you should keep it as the last piece you were working on with your little man. Is that a can of spray on Gesso I see? never seen it before. PS sympathy for your loss too. And sorry you had to make that decision, even if you know in your heart it was the right one. It's never easy. 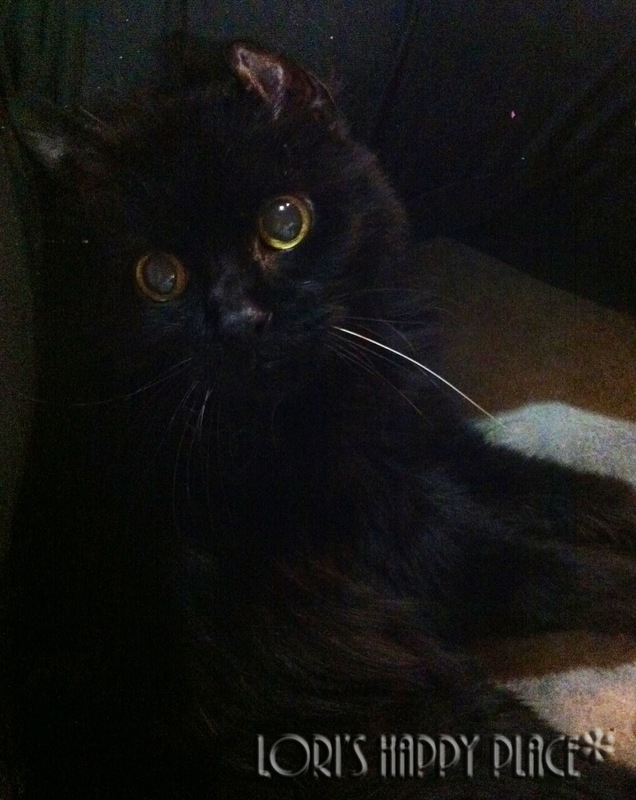 So sorry to hear about Spencer - our animal friends really do become our babies. He had a long life and obviously a very loving home. Great canvas work and look forward to seeing the latest one evolve further. Oh Lori, so sorry to hear about Spencer, but he will live on in your heart and all your happy memories. Your new canvas is magical, I could just take it as it is. Beautiful project - happy WOYWW to you! I'm so sorry to hear about Spencer's passing. Such a tremendous loss. So sorry to hear about your little cat, I remember when I lost my little cat Winnie, I'd had her for a very long time she was really lovely. I still love the bright flower canvas...it's lovely! Oh Lori so sorry to hear about Spencer. he must have been a very happy cat to have lived so long. The canvas came out really well. Ooh Lori, thanks for your comment on my blog. Lori, your work is beautiful. I love the canvas you are working on and the daisy is beautiful. But ... I have a lump in my throat and my eyes are prickign with tears as I think about the uknselfish act you had to perform. I know how hard ;it is to make the decision. My little cat was 19 and like you, she was a part of the family, as was the one that followed her (a stray that I only got to keep for 18 months - he had CRF) and my little dog who was the first to leave me. Aww Lori, such a hard thing to do, saying goodbye to a best friend like that, but 21 years and counting, that's amazing! 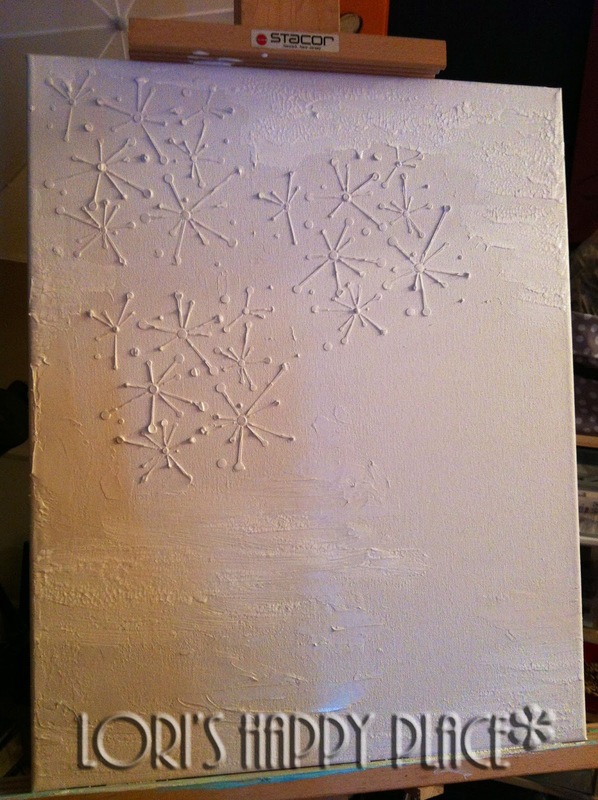 Love your flowers canvas and your new one looks like snowflakes so far to me! Sorry about your loss. Its never easy to lose a loved one especially animals as they are like children. The camera names should be the same all the world over goodluck when you get it, you will have fun. lovely daisy!!! wonderful work Lori!!! I'm so sorry that you lost your little furball. I know exactly how you feel - I lost 2 furballs last summer - they were 14 and 15 and once one passed - the other wasn't long behind. So sad, but the memories are worth it. I just love your daisy and the sentiment along with it. I look forward to seeing your friend's canvas along the creative path. Sorry to hear that you have lost your little friend, as a pet owner, dog in my case, I can empathise with your grief. Glad you showed your finished canvas, love the daisy, so simple and beautiful.thanks for visiting yesterday, been out all day at a craft show - more spending. Sorry to hear about the loss of your Spencer. His photo is lovely and he was certainly loved! Your canvas is gorgeous too! So sad to hear about Spencer. 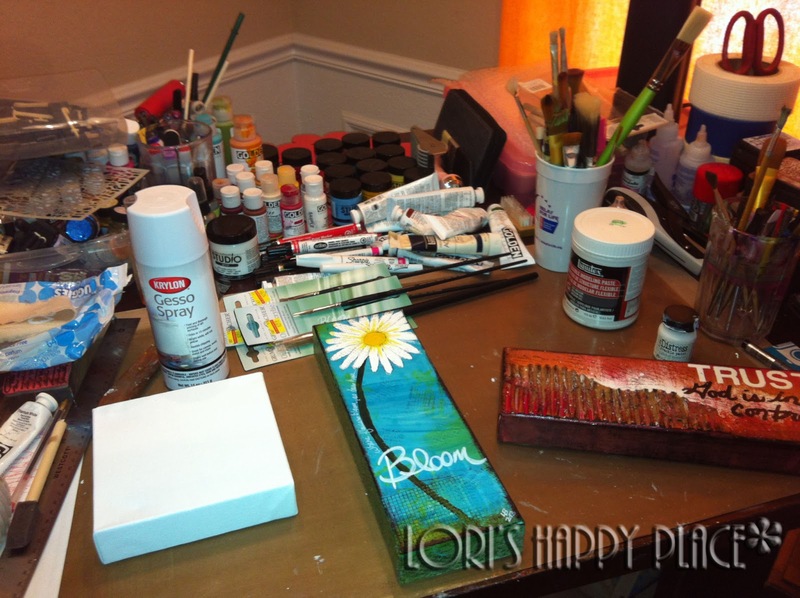 Love your canvas! Thanks for stopping at my blog and comment. Sorry for my late visit.